Greetings, visitors from Maritime NY Cultural Resources. 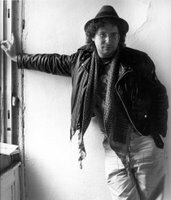 If you find this post interesting, you may also want to check out my other posts about Red Hook. I've notified Community View that at least one of my photos, Pier 41, has been copied to and is being used without attribution on the same page. This is a violation of the Creative Commons under which I make my photos available. If you are the author of the page, please remove the copies, link to the photo page instead, and provide correct attribution. If you know the author of the page, please let them know about this situation. This is one of the items we found in the basement of our house after we bought it. I'm calling it a "lithograph" just because I don't know what else to call it. It's in poor condition, as you can see from the closeups. I wanted to photograph it and share it in case others know more about what this is. 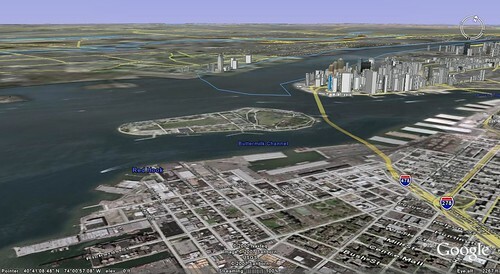 Here's a contemporary view from roughly the same perspective using Google Earth. 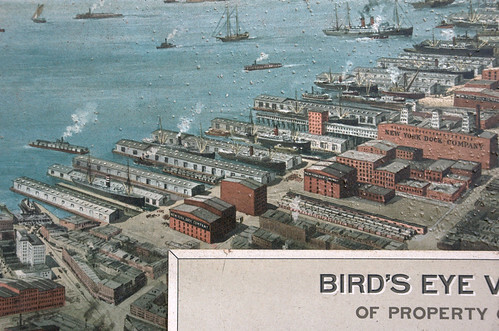 It provides an interesting snapshot of the working Brooklyn waterfront owned and operated by the New York Dock Company early in the 20th Century. 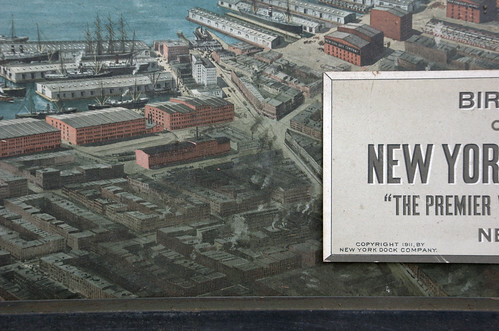 It ranged from East Red Hook, Atlantic Basin and Columbia Waterfront, North to Brooklyn Heights and Fulton Ferry. Mystery: I don't recognize the tallest tower here. My first thought was that it was the Woolworth Building. However, the details and colors of this tower are nothing like the Woolworth. Update: Josh Jackson of Built Environment Blog identified it as the Singer Building, which was the tallest building in the world for a few years, from 1906 to 1908. It looks like it was a magnificent building. It was demolished in 1968 for One Liberty Plaza. The Woolworth Building opened in 1913 and was the tallest building in the world until 1930. If this view was of that time, it should be visible here. 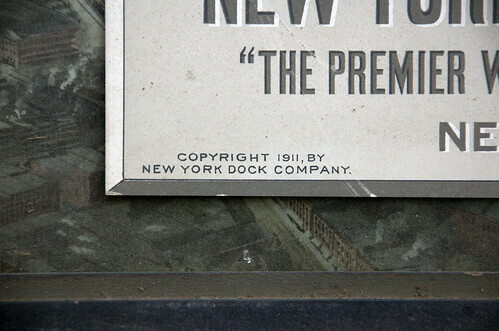 It's not, so that places this image before 1913, consistent with the copyright notice of 1911 in the applied label at the lower right. 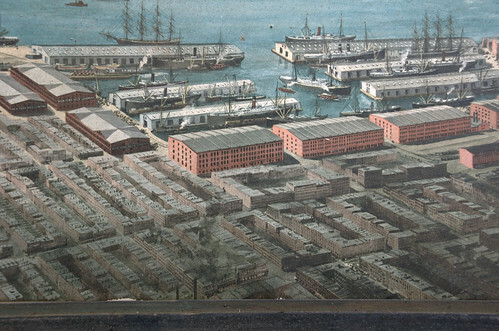 "“The Premier Warehouses and Terminal”"
Some details of the waterfront from South to North. 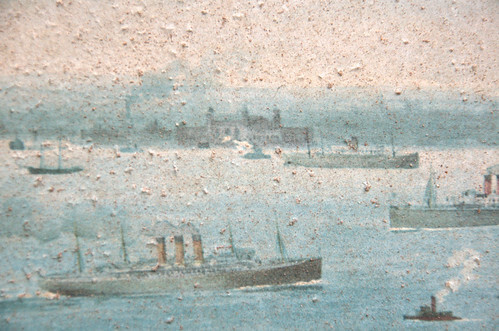 There are some nice details of New York harbor as well. 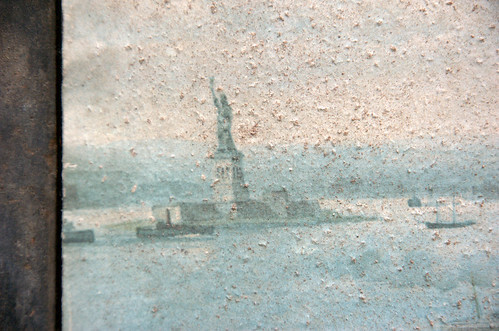 Statue of Liberty. You can really see the condition problems here. Great image, thanks for sharing! The tall building is the Singer Building (http://www.nyc-architecture.com/GON/GON003.htm). 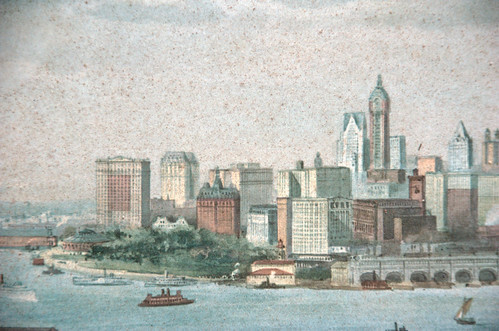 It was the tallest building in the world for a time, though it was demolished in 1968 to make way for 1 Liberty Plaza. J: Thanks for the id. I just updated the post with that info. Wow! What a great piece. 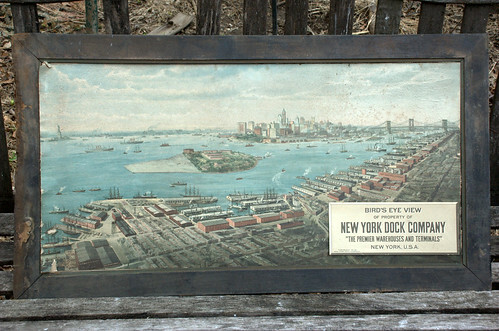 Before we moved to Ditmas, my wife and I lived in Redhook. That picture really captures the feeling of the place. 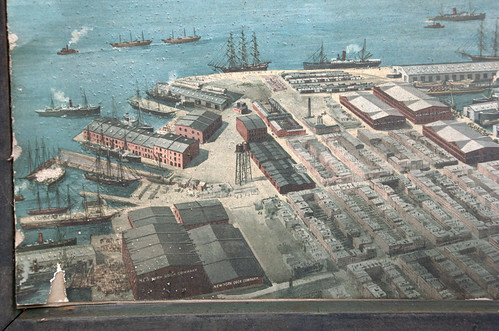 PortSide NewYork is working on a maritime heritage trail in Red Hook. I'd be interested to see this litho in person. I dont see a CONTACT link on your blog, so could you email me at carolinas@earthlink.net please. 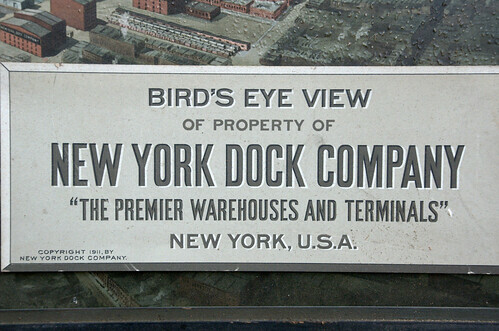 more about us at www.portsidenewyork.org. Thanks! Thank you very much for submitting this informative lithograph. 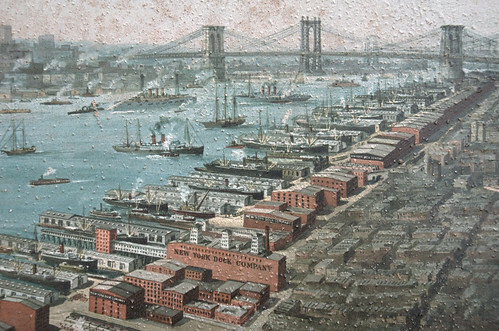 My family - from my grandmother though my great great grandparents - lived in the Red Hook neighborhood of Brooklyn and I have wanted to get an idea of what the neighborhood looked like back then for some time now. Google Street View is limited because I suspect that much of the neighborhood has changed since then. 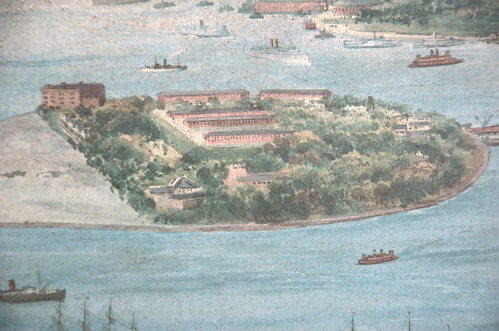 For example, today there seems to be a lot of empty spaces between buildings, but the 1911 lithograph shows blocks of apartment houses packed together behind the piers. That is what the neighborhood looked like when my grandmother grew up on Verona Street between 1900 and 1928. Thanks again! Hi. Saw this for sale at the flea market on W. 25th St. a few weeks ago. Looked very good, but very pricey.